“Eastside” is a well-made melodrama, full of smarts and lots of heart, that shows Mario Lopez, who played Greg Louganis in the Olympic diving champ’s television bio, is ready for the big screen. He’s good-looking and charismatic, with a star’s effortless command of attention. Lopez plays Antonio, who’s celebrating his 21st birthday as he ends a two-year sentence at Folsom (for getting caught working in a chop shop). He’s used his prison time to study the workings of the stock market and back in LA, heads for the posh law offices of his upwardly mobile brother Horatio (Mark D. Espinoza), who is not exactly glad to see him. Antonio, however, has a terrier tenacity and winds up following Horatio to a night club, where Antonio’s quick thinking saves the proprietor (Efrain Figueroa) from an assassin’s bullet. In an instant, Antonio discovers that Horatio is a fraud in thrall to Figueroa’s Armando de la Rosa, an underworld kingpin. In no time, Antonio, who has an amoral attitude toward success, becomes De la Rosa’s fair-haired buy, a terrific problem solver and a tough enforcer. 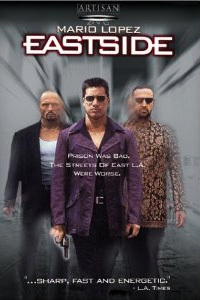 When Horatio fails to persuade the owner of an East L.A. youth center to sell his property, coveted by the never-seen Mr. Big to whom De la Rosa answers, Antonio is dispatched to do the job in his brother’s place. Up to his point, “Eastside,” written by Eric Sherman and directed by Lorena David with admirable crispness on the part of both, unfolds as a traditional gangster picture. But when Antonio comes up against Richard Lynch’s Mihalas Gabriel, some deft foreshadowing comes into play, suggesting that both brothers have much potential good in them.